When Is First Sunday of Advent 2019? The Advent season marks the beginning of the Christian year across many western churches in the United States. Its length varies from 22 to 28 days, starting on the Sunday nearest St Andrew’s Day and encompassing the next three Sundays, ending on Christmas Day. Is First Sunday of Advent a Public Holiday? First Sunday of Advent is not a public holiday. It falls on Sunday, December 1, 2019 and most businesses follow regular Sunday opening hours in the United States. Advent wreaths can be seem in some churches in the United States during the Advent season. Many Christians in the United States attend a church service on the first Sunday of Advent and may engage in activities such as special prayers and contributing to ideas on enhancing peace. Many Advent traditions are observed in the United States in the prelude to Christmas Day. For example, the Advent wreath is becoming increasingly popular in the United States. The wreath can be seen in various churches across the nation around this time of the year. Advent calendars of all designs are also given as gifts at this time of the year. The calendars feature openings in the form of windows or doors that are numbered to count the days to Christmas. Calendars may contain chocolates, toys, or candy and are given to children as a fun way to observe the Christmas countdown. Some traditional Advent calendars show 24 days but many Advent calendars showing 25 days, with the last opening on Christmas Day. The church year begins in September 1 in many eastern Christian churches, so Advent begins at a different time to when it starts in the western churches. The eastern equivalent of Advent is called the Nativity Fast, which runs for 40 days. The first Sunday of Advent is not a nationwide public holiday in the United States. However, churches may be busy on this day, as well as families who use the beginning of Advent as a time to prepare for the Christmas season. It is uncertain as to when exactly the celebration of Advent was first introduced in the Christian church. Some sources say that Advent began on November 11 (St Martin's Day) at some time in the fifth century in the form of a six-week fast leading to Christmas. Advent was reduced to its current length at some stage in the sixth century and the fasting was later no longer observed. Advent is originally a time to reflect and prepare for Christmas similarly to how Lent is in preparation for Easter. Advent has sometimes been referred to as the Winter Lent. 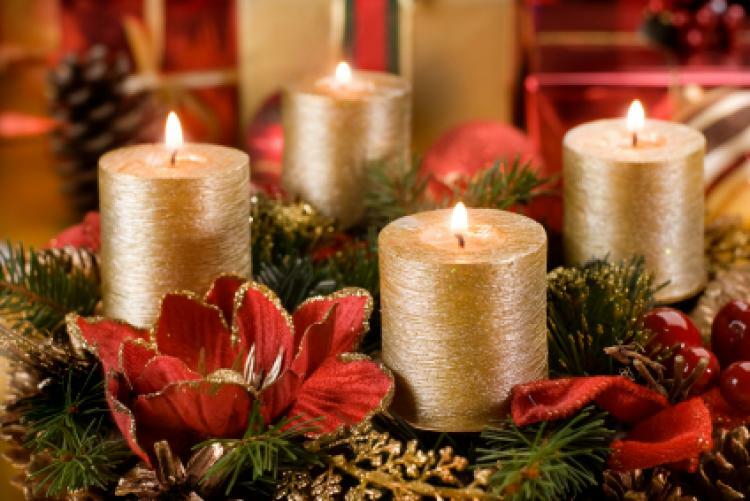 In recent times the restrictions that Advent brings to Christians have become more relaxed. Advent traditions spread from Europe to the United States, especially the Advent calendar, which became very popular in the United States after World War II as American military personnel and their families who were stationed in Germany brought them home and made them a part of the pre-Christmas traditions. Some people credit President Dwight Eisenhower with helping the tradition of the Advent calendar spread in the United States during the 1950s. Purple is historically the main color used for Advent because it reflects penitence, fasting, and the color of royalty to welcome the Advent of the king (Jesus Christ). The focus of the entire season is the celebration of the birth of Jesus the Christ in his first Advent, and the anticipation of the return of Christ the King in his second Advent. Some churches use other colors in recent times. For example, some churches mark the third Sunday of Advent with pink or rose, colors that represent joy. Many Protestant churches use blue to distinguish the Season of Advent from Lent. Advent wreaths are symbolic of Advent. They are usually made of fir and decorated with gold and silver ribbons or scarlet woolen threads. Lit wreaths may be displayed on the table where family and friends sit while singing carols and preparing handmade gifts. Read more about First Sunday of Advent.